Maple Leaf Cottage01535642337work Self-cateringWe bought Maple Leaf Cottage in 2017. It has been refurbished through-out. The en-suite has been upgraded with a new washstand, toilet and flooring. The bedrooms have all new mattresses, pillows, linens and towels. The sitting room has been redocorated with all new sofas and furnishings. The Ingle Nook fireplace is a gas fired stove and has all been completely serviced and retiled. All the floor coverings have been restored and replaced as needed.A dine in kitchen looks out onto a small courtyard garden. The cozy cottage is ready for your visit. Haworth is “Bronte Country” with history and character in abudance.The village hosts many themed weekends throughout the year. The hugely popular1940's weekend May 18-21 is quite the spectacle, with all the shops and people dressed in 1940's war period. There is also a 1960's weekend, Steampunk weekend followed by “Hawortheen” at the end of October. Christmas is like stepping into a Dickens novel! The Oakworth-Keighley Steam Railway offers steam enthusiasts of all ages many special days and events throughout the year.This is where the movie The Railway Children was filmed in 1970. The Yorkshire Dales National Park is a short 15 minute drive to the north. Skipton is a must visit, called the “Gateway To The Dales” and is a true gem with the castle, locks, daily market, interesting shops, pubs and restaurants. Further to the East are the seaside towns of Whitby and Scarborough. Other great places to visit include York, Saltaire, Harrogate, Hebden Bridge, Ilkley, Settle just to mention a few. Yorkshire is yours to discover!! There are so many nearby towns and villages to visit any time of the year.Come sun, rain, snow or whatever the season...the Haworth countryside will take your breath away and you will always want to come back to this lovely part of England. A mid-terrace Victorian cottage in Haworth and close The Dales. Perfect for families and couples looking for a Yorkshire break. 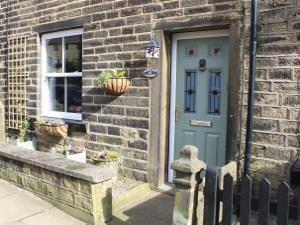 Maple Leaf Cottage is a 3 minute walk from Haworth Main Street. There are a good selection of pubs, restaurants and shops on the door step. There is a “Spar” grocery store with in 2 minutes in the car or a 10 minute walk.The Haworth steam train station is located opposite the grocery store.